At first you might think: “Everything has stopped growing, so there won’t be any seasonal foods in December”… However, it’s a time when traditionally we’d enjoy hot pots made with stews and stored root vegetables. “Christmas is coming, the goose is getting fat” says the old nursery rhyme. Historically we’d feed animals roots and grains and eat more meat at this time of the year. Foods, like Stargazy Pie, are also traditionally served in December. Talking of pies, did you know that mince pies originally contained mutton? Oliver Cromwell actually banned mince pies and when they were subsequently reintroduced, it was only at this point that people stopped putting meat into their mincemeat! Aside from meat, there’s lots of vegetables you can enjoy at this time of the year – try recipes including parsnips, they are a delicious addition to a festive spread. It’s fair to say, when we can smell chestnuts roasting, we think Christmas is not long away…the smell of clementines and cranberries also bring about a festive aroma, whilst add an extra spot of colour and vitamin C to our diet. Did you know another festive favourite, brussels sprouts, can taste sweeter and better after a frost? According to this article: “The frequent freezing and thawing of the vegetable leads to complex carbohydrates breaking down into simple sugars. The sprouts also tighten so they are less likely to become soggy when cooked”. Many varieties of British apples and pears are at their best about now – sweeter than when they were picked, but still crisp. Pickles made earlier in the year from surplus vegetables should be good now. Also, it’s about the time to try damson or sloe gins if you made any…MERRY CHRISTMAS EVERYONE! At the beginning of November is Guy Fawkes Night, also known as Bonfire Night. Maincrop potatoes are now available and are delicious baked. Why not enjoy a baked potato around the bonfire with some Reaseheath butter…! Other traditional treats for Bonfire Night include gingerbread men, toffee apples and parkin. The growing season is now virtually over, so we’re now more reliant on root vegetables and brassicas. Celeriac and squashes are now plentiful, and are great in vegetarian stews. Have you tried kale, which some say is one of the world’s most nutritious vegetables? Give it try – it tastes sweeter and has more flavour, after being exposed to a frost. November is a good time of year to buy lamb. Some people associate lamb with Easter – but that lamb has either been fed lots of corn (which means it’s tender, but has less taste) or has come from Australasia (high food miles). The lamb in November has usually been grass fed and as a result has more taste. Many also believe grass-fed lamb is better for you – as studies have shown that meat from grass-fed animals has two to four times more omega-3 fatty acids than meat from grain-fed animals. Stir-up Sunday takes place on the last Sunday before Advent. This is day that Christians traditionally make their Christmas puddings (after having heard a reading in church that begins Stir up, we beseech thee… ). October is one of the best times to find wild mushrooms. We have an amazing range of species, however you need to be very careful to avoid poisonous varieties. Guided foraging courses are available across the country and are well worth attending. If in doubt always ask an expert. There’s a wide variety of dishes that can be made with mushrooms, garlic mushrooms, mushroom omelette, mushroom pâté, mushroom risotto, mushroom soup and mushroom stroganoff name just a few. It’s also a good time of year for game, as pheasant and partridge are now season. At this time of year we are lucky to have a fantastic range of apples. You’d expect Chester Pearmain or Chester Pippin apples to have their origins in Cheshire, and even Mere de Menage, when it’s called by its other name – Lord Combermere. But Lord Clyde and Lord Derby also have their roots in Cheshire (sorry about the awful pun) when we’re talking about apple varieties and not aristocracy. At Reaseheath we hold an Apple Festival every year, and most of our visitors are amazed by how many different varieties we have on display. This year it’s on the 11th and 12th October. You can out more information at: www.reaseheath.ac.uk/apple-festival. Apple pie is a family favourite for many, but why not try something a little different…? Have you tried a Cheshire fidget pie (made with bacon and apples) or a Cheshire cheese and apple pie? Why not give them a go and let us know what you think! Get your teeth into a “Bloody Ploughman” this October and remember an apple a day keeps the doctor away! For some more October inspired recipes and information, take a look at BBC Good Food, VegBox and the Eat the Seasons October update. “Season of mists and mellow fruitfulness” is how John Keats starts his ode to Autumn. It’s a great time to harvest members of the Cucurbitaceae family (like courgettes, cucumbers, marrows, melons, pumpkins and squashes). Courgettes and marrows are best consumed before they get too big – if you have a surplus, why not make some chutney? Roast goose would traditionally be consumed on Michaelmas Day (29th September). Michaelmas Day is a Quarter Day – historically one of four days when rents would be paid and servants hired. It’s the middle of the blackberry season, try picking some wild ones – they’ve got much more flavour than the cultivated varieties. During World War One The Ministry of Food, in conjunction with the Board of Education, organised a national collection of blackberries to help the troops. Children were given time off school to collect them. Try blackberries in charlottes, crumbles, fools and pies. It’s also the time to enjoy damsons. Market Drayton used to have Damson Fairs where the fruits were sold as to dye clothes. Before artificial colourings, purple was one of the hardest colours to produce, which is why a Cadbury’s used purple on their wrappers (as people associated that colour with quality). There’s an excellent guide on Damsons here. They make a wonderful jam and, like sloes, also make a nice fruit gin. British pears are also at their best now. Handle them carefully, as they bruise easily. A ripe juicy pear is delicious just as it is, but they also make some delicious desserts. Try poaching them in red wine, or with lemon juice and cinnamon. Pears also go well with chocolate. There’s lots of different fresh fruit and vegetables in the garden in August. It’s a time for alfresco eating and barbecues. Enjoy runner beans (one of the easiest vegetables to grow). Remember to pick runner beans regularly, whilst they’re still young and crisp, and you’ll also encourage more pods. It’s the salad season – try adding some sorrel leaves to add interest to your salads. They naturally have a sharp taste (due to oxalic acid). If farmers have lots of sorrel it could mean their land needs lime! Mint is a useful herb, and can be used to liven up vegetables like peas and potatoes, Besides garden mint, there’s many other sorts. Have you tried apple mint or pineapple mint? Spearmint and peppermint aid digestion, and you can also make mint tea. It’s also the start of the British plum season which come in all sorts of different shapes and colours. Some of the tarter varieties are better cooked. Plum sauce is good with duck, and how about a plum cobbler or crumble? Don’t buy under ripe plums, they’re best picked when they’re ripe – just before the wasps have them! If you want to learn more about plums, I can recommend a visit to Pershore Plum Festival. Country sports enthusiasts refer to the 12th August, as this is the start of the shooting season for red grouse. Lancastrians celebrate St Oswald’s Day in August with a Tosset Feast. Tosset Cakes (similar to Goosnargh cake) would traditionally be made to eat on this day. July is a wonderful time for fruit lovers! Cherries are thought to be introduced to this country by the Romans. They say you can tell if it’s a Roman road if there are wild cherries lining it (after the Romans spat out the pips)! British cherries have a much better flavour than many of the cherries we import. Try morello cherries, they’ve got a wonderful flavour, but rather tart so you may need a bit of sugar! In Cheshire gooseberry growing is taken very seriously! They’ve been holding Gooseberry Shows in Goostrey since 1897. Goostrey, and some other neighbouring villages, still have shows in July – and the competition is very fierce! The gooseberries are picked in the presence of a witness and then put into boxes, (the one I’ve photographed is over 90 years old). The boxes are tied with string and the knot is sealed with wax and stamped. The seal must be intact when brought to the show! They are then weighed in pennyweights and grains. 24 grains = 1 pennyweight and 18 pennyweights = 1 ounce. The worlds heaviest gooseberry was grown by a Cheshire grower, Kelvin Archer. His gooseberry weighed 64.49g (the same as a large egg). Gooseberries make lovely crumbles, fools and pies. Gooseberries are also rich in pectin, making them ideal for jams and jellies. Gooseberry curd makes a pleasant change from lemon and can easily be made in a microwave. The sharp flavour of gooseberries also goes well in savoury dishes to accompany oily fish like mackerel or duck. Gooseberries also make great chutneys and preserves to accompany Cheshire cheese. Historically many Cheshire dairy farmers would grow potatoes. They would use the manure from the cows to feed the crop and any potatoes not fit for sale would be then be fed back to the cows. May is the time when we can expect to see the first new potatoes. Don’t peel them (all the nutrients are just under the skin). Just scrub them and then simmer gently for approximately 15-20 minutes until they’re just tender. You can also cook them in a microwave. If you’ve got a few left over, add a bit of mayonnaise and some fresh herbs, and you’ll have a wonderful potato salad. Did you know that asparagus are the young shoots of a cultivated lily plant? If you don’t have any in your garden, you’ll find local asparagus in the markets in May. After eating asparagus, some people find their urine has a strong, unusual odour. There’s a debate among scientists, as to whether some people don’t make these sulphur compounds, or simply just can’t smell them. Anyway eating asparagus helps you fight cancer and reduce heart disease as well as boosting your immune system. It’s been described as a super food (www.british-asparagus.co.uk/superfood.php). If you’ve not eaten asparagus do try some (don’t over-cook it). I think it tastes nice and it’s definitely different and greener than the asparagus that’s been flown in from Peru! We’re now well into spring, so it’s an exciting time for the gardener, and also for cooks who like to use seasonal foods. Instead of root crops stored over the winter, we can look forward to spring vegetables. Traditionally young nettles would be harvested to make a fresh soup. Nettles are an excellent source of vitamins, minerals and protein (and don’t worry the sting goes when they are cooked). Have you tried sorrel? In spring young sorrel leaves can add a sharp flavour to a salad. It’s also the start of the crab season, crabs are tasty and packed full of protein and omega-3 fatty acids. 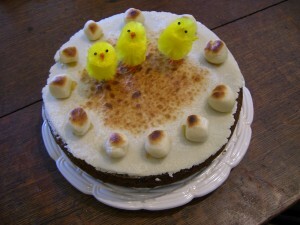 For Christians, Easter is the end of lent – which means they can again enjoy foods they may have given up during lent. We can’t mention Easter without thinking of eggs – with longer day lengths traditional outdoor hens will start laying again. In the past we’d paint or dye eggs to make them look pretty at Easter. Chocolate Easter eggs is a relatively new tradition… Lamb is another food associated with Easter, and roast lamb is the main dish at Jewish Passover. Other foods traditionally served at Easter include Easter-Ledge (or Dock) pudding, Easter biscuits and that Good Friday favourite – Hot Cross Buns. The 1st March saw St David’s Day, and leeks are one of the national symbols of Wales. March is the end of the leek season, try them pan fried or in casseroles and soups. Mackerel are at their best in March, they’re a rich source of omega-3 fatty acids – so it’s tasty and good for you. Try to buy line caught mackerel, which is more sustainable. The Fourth Sunday in Lent 2014 is Laetare Sunday or Mothering Sunday, which this year falls on March 30, 2014. On this day Christians relax the strict rules of lent and is eaten. Traditionally eleven marzipan balls are used to decorate the cake, with a story that the balls represent the twelve apostles, minus Judas. There’s several explanations about where the word Simnel comes from. My favourite explanation is that old couple, called Simon and Nelly, argued about what to do with a piece of dough. Simon wanted to boil it, and Nelly to bake it, so they compromised and did both! The cake of Simon and Nelly was called Sim-Nel, or Simnel! There’s regional variations of this cake including Devizes, Gloucester, Shrewsbury and Bury versions, see here for more information.